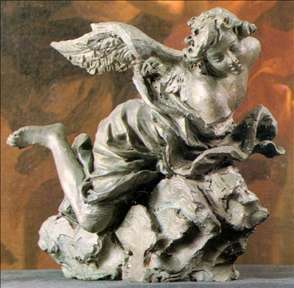 Italian Late Baroque sculptor. Soon after his birth he moved with his family to Siena, where his father, Dionysio Mazzuoli, an architect and engineer, undertook to rebuild Prince Mattias palazzo. Giuseppes earliest training was provided by his younger brother Giovanni Antonio (1644-1706), who remained behind in Siena when he himself went to Rome. There Giuseppe entered the workshop of Ercole Ferrata but worked directly under Melchiorre Caffa. So, probably sometime in the mid-1660s (Caffa died in an accident in 1667), this Sienese sculptor became part of a rich artistic culture in Rome. His first project involved the funerary monument to Alexander VII in St Peters, supervised by Bernini, to which he contributed the marble figure of Charity (bozzetto prepared by Bernini c. 1673). He kept the Berninesque tradition alive and untouched by French classicism. He worked in Rome after 1686, and completed Caffa s Baptism of Christ in Valetta cathedral, Malta after Caffa s early death. 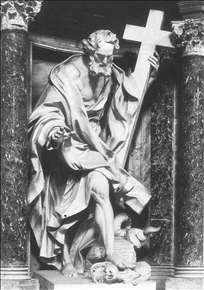 His twelve Apostles, originally in Siena Cathedral, are now in the Oratory, London. In 1675 Mazzuoli became a member of the Congregazione dei Virtuosi al Pantheon and in 1679 a member of the Accademia di San Luca. See more details about "St Philip"